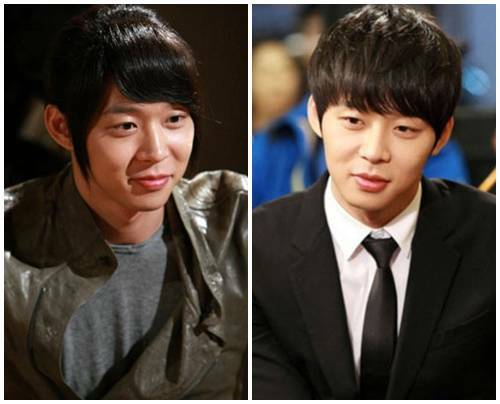 The “sweet photo” of actor Micky Yoochun in “Rooftop Prince” lifts the armament of female hearts. The official website of SBS drama “Rooftop Prince” published the photos of Park Yoochun with the title of “Lovely eyes! Gentle man!” It uses the stills while filming the series to show the look of Park Yoochun, who plays the role of Crown Prince Lee Gak, before and after cutting short his hair. Before cutting the hair, Park Yoochun first tasted the liquor, tapas and whipped cream, he was wearing a brown jacket and shown a lovely smile. The next photo shows his look after cutting the hair and wearing a black suit. The fair skin, round eyes, red lips, shaking the hearts of countless women. Netizens commented on the photos, “Really is a warm outlook”, “How can you look so good. Falling into his eyes”, “Will automatically smile even by just watching” and so on.